Good post! Hopefully it will shut NIMBYs up but i don't think that'll happen. Many thanks for shedding some light on underground options. Though I know you are aware of it, your post did not seem to emphasize that any underground alignment for the mid-Peninsula would most likely include both types of tunneling. Some sections of cut and cover, which is typically much cheaper, and some sections (probably short ones) of deep bore. For example, it is extremely unlikely that cut and cover methods would be allowed anywhere near El Palo Alto, due to redwood trees' unusually shallow root system. Any tunnel in this section of the route would almost certainly be bored and thus safely below the root system to minimize disturbance. In general, since there are no buildings on top of the existing rail right of way, cut and cover would be preferred in most sections for reasons of cost control and easy access. 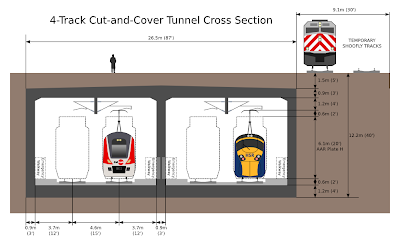 While I continue to believe that tunneling may prove to be a good option for certain sections of the HSR and Caltrain route, a panacea it is not. In case anyone is interested in what 4 tracks above ground would actually look like. Here's a link to the Google Maps overhead view of the Caltrain tracks just north of Atherton in Redwood City (or technically unincorporated San Mateo County's North Fair Oaks) where there are already 4 tracks today. some sections of the ROW are just 55' wide, with high-end residences chock-full of NIMBYs who will sue until the cows come home. Any cost estimate needs to consider likely construction cost escalation as a result of drawn-out litigation. The state of California would be very well advised to set up a special court specifically for the HSR project to deal with any such cases quickly. width requirements could be reduced by stacking tracks 2x2 with water conduits in-between. It would be difficult and expensive to construct, but it would avoid a lot of eminent domain takings, reverse condemnation suits etc. Ideally, there wouldn't be any shoofly tracks at all, at least not in these most contentious sections. Instead, shuttle buses should transport Caltrain passengers between the active stations to either side of the construction site. That's not possible for UPRR, which is why I would suggest repairing the Dumbarton rail bridge first and asking UPRR to use that - at least while tracks are being constructed through the mid-peninsula. To limit the run length required to reach the lower level, it might make sense to reserve it for HSR and put Caltrain locals/UPRR on the upper level. To limit the aerodynamic interactions of two trains passing at a relative speed of 250 mph, the track centerline would have to be increased from 15' to 24'. That would mean the lower level incl. walls would be 54' wide. The ceiling might have to be mildly vaulted to avoid a row of center columns. For the upper level, 45' width would be sufficient. The difference could be used to accommodate water and other conduits that have to be re-routed. Needless to say, any solution that keeps at least two of the four tracks above ground would be a whole lot simpler and cheaper. four tracks at grade isn't really a big deal, even if trains run past at 125mph, as long as they do so in the center tracks and there is sufficient noise mitigation. The issue is that keeping the tracks at grade means all of the remaining grade crossings have to become deep under- or tall overpasses, with significant impacts on frontage roads and the first block of houses to either side of the tracks. Given that there are still about 45 grade crossings between SF and San Jose, it's not surprising that CHSRA is looking to change the elevation of the tracks. Rafael: My commute by Caltrain would already take almost an hour and a half (end to end, the train itself is about an hour). If you add another 20 minutes and two transfers... I don't think I would still make that commute. And I don't think I'm alone in that. Closing even part of the line and instituting shuttle buses would completely undo all ridership gains from the Baby Bullet and then some. I very much doubt Caltrain would go for that. And on the general topic of tunnels: the whole point of the NIMBYs begging for tunnels is so that they can complain again once the tunnel is being built and their house falls in or whatever. it could be a lot cheaper to compensate Caltrain for loss of revenue during construction than to build (a) shoofly track(s) after highly contentious eminent domain against private residences and/or loss of frontage roads. Btw, depending on Caltrain's ridership patterns, there may be scope for running some buses over longer distances to make the temporary situation less onerous. Railways all over the world use substitute services during major track work. You can't make an omelet without breaking any eggs at all. In addition, if the Dumbarton rail bridge is restored first, SF-RC-Santa Clara-SJ Caltrain service would still be possible during construction of the southern section of the HSR/Caltrain/UPRR remodel. @Bossyman, the intent is certainly not to shut anyone up. I only want to add relevant facts to a healthy discussion. @Rafael, I think you may be overestimating the difficulty of eminent domain proceedings--maybe because of the snarling threats of lawsuits emanating from certain quarters. VTA and SamTrans have lots of experience and have been there, done that. Any "extreme engineering" is unwarranted. I agree, since I am well aware of how much quieter lightweight electric rolling stock can be as compared to heavy diesel-powered trains. My link to the 4 existing tracks north of Atherton was to highlight that the supposedly "unimaginable" alignment of 4 tracks at grade on the Peninsula is hardly any different from the 2 tracks at grade along the entire route today and that 4 tracks already exist in some places right next to suburban homes. To be clear, I was not suggesting restricting the rails to being at grade, since every at-grade crossing in need of separation or removal should have an alignment based not only on what the neighbors think, but also on what is most feasible and cost effective from an engineering perspective. I'm confident that you agree there is not one alignment solution that is appropriate for every crossing and that some tunneling will likely be used for at least a few crossings. Clem, thanks for reinforcing what the majority of Peninsulan's know instinctively - that tunneling is a non-starter, and is just as stupid and damaging as the suggested over ground implementation of widening Caltrain to 4 wide tracks and squeezing 125mph trains in through residential neighborhoods, behind schools, backyards, neighorhood streets, etc. HSr supporters I think may be underestimating the level of "We support hsr - Done Right." Which is to say this contingent supports HSR very much in a tunnel scenario - only, and they very much DON"T support HSR any other way through this route. Which means CHSR currently OVER ESTIMATES its HSR support in the Peninsula (ie: measure 1A supporters, etc) by a mile. My prediction is that once all these 'hsr done right' supporters are duly convinced that tunneling is a no go, you'll be hit by a tsunami of political fight against hsr on this route. So far, what you see is a watered down opposition to hsr on the Peninsula, because CHSRA has so far not out and out denied the tunnel option. (So far, you still have all these city council two-bit fence sitters able to say they support HSR because they can still say with a straight face that they prefer a tunnel. I'm thankful to Clem for getting the tunnel nonsense closer to 'off the table', because the sooner this happens, the sooner you'll see all these cities officially lining up to oppose. Rafael: After a couple months of busing, I'll just buy a car. Or move to back to Boston. Caltrain has worked very hard to build up ridership, and closing the line is going to kill it, and it's not going to come back for a long time. Trying to accommodate Caltrain's current ridership on a bus is also going to be quite a challenge: the trains provide a capacity equivalent to 75 buses per hour. So I think we're going to have to take it as a given that Caltrain is mostly going to keep running during construction. There might be single-tracking, schedule changes, and weekend closures, maybe even a closure as long as a week or two for really major work. But the service has to keep running. Actually, most HSR supporters are well aware that the "Tunnel or Nothing" crowd are thinly-veiled advocates of "Nothing". That is why they are called NIMBYs and should be ignored. I support properly studying tunneling, but I do not support "Nothing". As for support on the Peninsula, the realization by other residents that NIMBYs are trying to obstruct HSR outright and are not actually interested in HSR being constructed in an optimized or properly mitigated way based on engineering feasibility, will reduce their support dramatically since they will no longer be able to hide behind ridiculous statements like, "I support HSR, but it needs to be done right" and retreat to the more accurate, "I do not support HSR anywhere near my home and fast trains should remain far away from me, like in Japan". The vast majority of Californians, even on the Peninsula, do not support selfish NIMBYism, particularly when it is coming from an affluent suburb. "do it in a tunnel - or overground - anything the engineers tell us they have to do is OK with us" definitely is NOT the point of view of the majority here. The vast majority of Californian in fact, do support protecting their own property rights, their own healthy and safe communities, and would not support 'taking one for the team' when it means 75 foot wide tracks, 125mph trains every three minutes, on 20 foot solid walls, and high voltage electrical strung over their schools and backyards. You're frankly higher than a kite if you think 'most californian's' would sit by for this kind of crap in their own communities. Go ahead and stereotype and degrade the severely impacted communities concerns as 'nimby's' and ignore them. That's fine by me, all the more suprise for you two years from now. Resident: "Clem, thanks for reinforcing what the majority of Peninsulan's know instinctively ... just as stupid and damaging as the suggested over ground implementation of widening Caltrain to 4 wide tracks and squeezing 125mph trains in through residential neighborhoods, behind schools, backyards, neighorhood streets, etc." That's the advantage of knowing something instinctively ... there's no need for any relationship with reality. For most of the Caltrain ROW, 4 tracks is no sqeeze at all. The existing ROW has ample room for 4 tracks for almost the whole route. There are only a small handful of tricky parts. So making 4 tracks the issue based on "instinctive knowledge" is vulnerable to the opposing strategy of "actual, real world knowledge". 90%+ of the challenge is the grade separation. Under 10% of the challenge is the width to run four tracks through. The vast majority of Californian in fact, do support protecting their own property rights, their own healthy and safe communities, and would not support 'taking one for the team' when it means 75 foot wide tracks, 125mph trains every three minutes, on 20 foot solid walls, and high voltage electrical strung over their schools and backyards. Everyone supports protecting their own property rights and very few people actually live alongside the tracks. I live just a few blocks away and none of what you describe seems especially concerning. The "75 foot wide tracks" presumably refer to the right of way's width (not the track's width), which is already that wide for nearly its entire length. The number of tracks laid within that right of way has essentially zero impact on me. 125 mph trains every 3 minutes as opposed to 79 mph trains every 5 minutes (which is what we have twice a day at rush hour right now) is little different since the faster trains will be blowing 96-110 decibel train whistles less frequently, if at all. High voltage electric catenary is necessary to electrify Caltrain and is already planned in the near future with or without HSR. 20 foot solid walls will only be needed for short sections near certain grade separations. If you are actually in favor of "healthy and safe communities" you have to support grade separations since the current at-grade crossings have long proven dangerous and and at times deadly. Similarly, electric trains eliminate diesel particulate pollution from the current Caltrain locomotives, clearly improving health in the vicinity. The "Nothing" supporters continue their loose relationship with the facts, as Bruce McF rightly pointed out. No Resident your arrogant demands that no HSR will happen are as SILLY as that stupid parade you where in..Bring the "kids" to Chucky cheese after? So Resident was one of the 50 who marched against HSR in PA? What's the population of PA again? Let's be thankful for citizens like Andrew who can counter the BS of NIMBYS like Resident and BAR. By the way Resident, where are the facts to back up your ludicrous claims? "Resident" is welcome to participate here. Claims and counter-claims about the extent of the support for the HSR project are irrelevant. The support is what it is. The most effective democracy is a well-informed democracy... once everyone is informed, let the chips fall where they may! While I agree that a tunnel has no cost/benefit in a suburban location like this (particularly when CHSRA doesn't even want to build the tunnel to the Transbay Terminal), it does not help (and is not necessary) to exaggerate the case against a tunnel. 1. Two shoofly tracks should not be needed. Regardless of final grade separation configuration, Caltrain will have to get used to extensive single-tracking for years to come I'm afraid. 2. If space permits (don't that it does...) single shoofly track can be left in place after the new line opens, to be used for any legacy diesel freight service. This obviates the need for extensive venting. 3. If the tunnel is relatively short, reducing speeds to 100mph or even 79mph will have negligble impact on timetable, and might reduce aerodynamic clearance needed. 4. If Berkeley's experience with undergrounding Ashby BART is any indication, I'm willing to bet that if Palo Alto hired a competent firm to design/build the tunnel, it would be 5x cheaper than the per-mile cost you have extrapolated from VTA's BART-SJ monstrosity. And let's not forget that the only reason we are having this discussion is due to fraudulent selection of Pachecho route. (3) Pretty soon the HSR will lose its 'H'... permanent speed restrictions should be avoided at considerable cost. (I had estimated about $1 million per second saved). If anything, tunnels might be an opportunity to increase speeds to 150 mph. (4) Berkeley's BART tunnel is a 2-track, 3-mile affair with just two stations. Menlo Park-based opponents envision a 4-track, 7-mile tunnel with five stations. That's before San Mateo and Burlingame get added! By the way, does anyone have some numbers on how much Berkeley paid for their tunnel? I am unsure of the exact details, but I believe it was a $12 million bond issue approved by Berkeley voters on October 4, 1966. It switched the planned alignment from above ground to underground just for the Ashby, Berkeley, and North Berkeley Stations. In 2009 dollars that figure would be something like $75 million, assuming I did my conversion correctly. I do not know what portion of the actual costs that figure covered or if it was the entire price tag or just the differential from the planned above ground design. I also do not know if federal matching funds were involved or not. Both federal funding and Bay Bridge toll allocations were used to help fund BART's original construction. San Mateo County backed out of their original agreement to participate in BART due to tax issues and the existing Southern Pacific commuter service. Marin County backed out once it became clear that another under-Bay tube would be needed (since the Golden Gate Bridge could not accommodate rail traffic) and that tunnel was prohibitively expensive. Here is a link for more than you ever wanted to know about the history of BART. agreed on the higher speeds through tunnels. If you're going to spend that much, you should have something to show for it. However, at some point two single-track tunnels with cross-connects would become preferably to one dual-track implementation, in terms of aerodynamic stability and safe evacuation routes. Tunnels longer than 6 miles must have a separate service tube. However, stations along the way do count as access/egress locations and therefore divide a long tunnel into two shorter ones for the purposes of this requirement. "For most of the Caltrain ROW, 4 tracks is no sqeeze at all. The existing ROW has ample room for 4 tracks for almost the whole route. There are only a small handful of tricky parts." All in the perspective isn't it. If all you need to worry about is laying tracks, the space may be there. However, if you are a dense community built up around 2 -wide tracks, where there is open space between the existing tracks and the major roadways, and open space between the existing tracks and the homes, and there are huge screens of trees that act as screens for blight, noise, air displacement.. And then you suggest expanding to 4 wide tracks using up all that existing open space, pushing tracks and trains right up against the community land uses, and replacing natural vegitation screens with concrete walls.. Then you're wrong. It is a squeeze. See the problem with the handful of train lovers participating on this blog is that they are feeding off their own myopic lack of discernment. Never fear however, the communities you are blithley dismissing will help set this right. Clem, as usual is absolutely right on - that what I say about the level of support is meaningless, it will be what it will be. And I can't WAIT for the day CHSRA comes right out in the open and says - we're not tunneling. replacing natural vegitation screens with concrete wallsReplacing vegetation with concrete is indeed a major concern. One of the most important, but mostly overlooked, aspects to consider of any above grade alignment on the Caltrain tracks is the landscaping. It is very easy to grow a wide variety of screen plants in our climate, many of them very quickly. It is not coincidence that San Francisco's Presidio is a forest of Eucalyptus, Monterey Cypress, and Monterey Pine trees--they were planted by the military in the late 1800s to generate overhead cover for their new Pacific headquarters as rapidly as possible. For rapid screening where high overhead cover is unnecessary, consider planting Acacia trees. In Palo Alto's climate they grow to about 20 feet within 3 years, with dense fern-like year-round foliage and attractive yellow flowers in the late winter. If heights of only ~10 feet are needed, oleander flowering shrubs are super-fast growers with dense leaves that block sight and sound alike and lovely summer flowers in red, pink, or white. If you have a vertical wall to cover and very little ground to work with (which is only likely to be the case in a few stretches along the right of way), then ivy, morning glories, or other rapidly growing climbing vines are appropriate, since they only need about an 8 inch strip of dirt and a little irrigation in a climate like ours. Instead of beginning with an attitude that no solution is viable, let's put some effort into understanding how to mitigate the problems associated with each alternative. Andrew Bogan has provided some excellent examples of fast-growing vegetation. Oleander is already a prominent feature along much of the Caltrain ROW; it is hardy and attractive and provides excellent screening. Another possible part of the solution might be a sound tube. The one in Australia looks very modern, one could be designed in a manner more in keeping with Peninsula aesthetics, and it could still be surrounded by vegetation. vegetation, including climbing plants where there is no space for trees or shrubs, will indeed substantially soften the visual impact of any elevated alignment. However, don't expect much in the way of blocking sound - you need solid mass to block transmission paths. use thick glass on the sides of that sound tube, cover the roof and put a boardwalk, some planter boxes and some ventilation shafts on top to get what I had in mind with the vitrine. Andrew - you keep insisting on ignorning the fact that there will be no room for planting trees or "Oleanders" (garbage planting for freeway medians = not equivalent to full grown trees that are there now, by the way). Particularly since they're talking about maybe taking not much more than an inch or two here or there to fit the tracks in - that means zero extra space. However, you can be sure that CSHR will be purchasing the trees and the land to plant those trees, particularly for schools, parks, and other public and private spaces. So you're right in that, I shouldn't worry too much about the trees. The trees WILL get replaced. If 75 feet is needed to run four tracks, the average width (112 feet!) allows ample room for four tracks and all sorts of planting. There are a few places where space is tight, and we will have to think creatively. But don't extrapolate the issues of six per cent of the Right of Way to the entire thing. Rafeal: "vegetation, including climbing plants where there is no space for trees or shrubs, will indeed substantially soften the visual impact of any elevated alignment. However, don't expect much in the way of blocking sound - you need solid mass to block transmission paths." But a living wall installation on a sound wall with shrubs or trees in front will both soften the visual impact of the wall and ... assuming its a well designed sound wall ... baffle the sound. So the question becomes, high how above the track level is required to provide substantial sound mitigation. My vague impression is that it is substantially different for EMU's at moderately high velocities than for the clanking of a heavy freight train braking to or accelerating from a stop. use thick glass on the sides of that sound tube, cover the roof and put a boardwalk, some planter boxes and some ventilation shafts on top to get what I had in mind with the vitrine.Sounds great. Who pays for it? "Oleanders" (garbage planting for freeway medians = not equivalent to full grown trees that are there now, by the way)Really? Oleanders seem to be good enough for the Emperor of Japan, who has a fine collection surrounding his palace in downtown Tokyo. Sunset's Western Garden Book, the bible for California gardeners, describes the Mediterranean native flowering shrub as being "attractive in all seasons". Even if one does not care for oleanders, several species of trees were also mentioned by name in my prior comment. Acacias are full sized trees that will grow over 20 feet in height in less than 3 years with excellent visual screening year-round. They need little water and less than a two-foot strip of exposed dirt. In fact, containing their root system is recommended. Eucalyptus also grow rapidly in California (oddly less so in their native Australia) and already line many sections of the Caltrain tracks. In Peers Park, adjacent to Southgate in Palo Alto, the eucalyptus trees along the tracks are so large that they provide almost no screening at ground level (except for their white trunks). Newly planted trees would actually be an improvement for screening views of the trains in Peers Park, though I will be sad to see some of the older trees go. Rafeal: "use thick glass on the sides of that sound tube, cover the roof and put a boardwalk, some planter boxes and some ventilation shafts on top to get what I had in mind with the vitrine." Adirondacker: "Sounds great. Who pays for it?" Up to the cost of a partial or full elevated viaduct, that would be the CHSRA (does Caltrain kick anything in for their share of the trackwork?) ... beyond that, the local community getting unnecessary bells and whistles. And Resident the trees are ON Railroad property if Caltrain wanted they could be removed with or without HSR and will with expansion. 1) San Mateo mentioned that 110 feet would be required during construction for above ground. I think most trees are toast. You could have some ivyish stuff and some more interesting things in the wider spots but you have a problem with anything that grows too fast because it will be problem for wires. 2) The group advocating tunneling is advocating deep tunneling for precisely the reasons you pointed out - trenches or cut and cover tunnels will have huge costs associated with them during construction so much so that tunneling will likely be cheaper. According to the City of Palo Alto website, they only list 7 heritage trees. It would appear that only El Palo Alto (Heritage Tree #1) is close to the tracks and nobody is considering removing it. The City also has strict rules on removal of all mature redwoods and native oaks above minimum trunk diameters, but it is unclear if Palo Alto even has jurisdiction over trees on Caltrain's property. As for fast growth, it does not necessarily imply any risk to overhead wires. Acacias do not spread especially wide at their canopy (~20 feet) and they are only about 30 feet high at maturity (but they reach this height extremely quickly and then fill out). Large conifers or eucalyptus could be more of an issue with regard to wires, but many good options exist and Palo Alto's arborists are quite expert on these topics. I wonder how many HSR "proponents" in this and other blogs post from far off locations; many comments I see indicate unfamiliarity with the geography. (Most notorious example, "CHSR-blog" author professing his expert opinions from way out in Monterey). For the scale of aerials being proposed, it is preposterous to suggest ivy, Acacias, or any other landscaping will "soften" the impact. I don't think this should necessarily preclude construction of aerials, but to suggest that landscaping will just cover up the visual impacts is intellectually dishonest. @BruceMcF - I've heard you mention the living wall before - do you have a link to a picture? Sorry if I missed it. I wonder how many HSR "proponents" in this and other blogs post from far off locations; many comments I see indicate unfamiliarity with the geography.I live in Palo Alto, a few blocks from the Caltrain tracks and I used to live in SF a block from the N-Judah tracks. I am very familiar with the local geography. However, HSR is a state-wide project of national importance that will receive a lot of state and federal funding, so claiming some kind of superiority due to proximity to the Peninsula is odd. For the scale of aerials being proposed, it is preposterous to suggest ivy, Acacias, or any other landscaping will "soften" the impact.Nonsense. Nobody is saying that every portion of every track, train, elevated structure, or catenary will be blocked by trees or shrubbery. Nor is that the case right now. The concept of "softening" a visual impact is one of creating visual distraction that is more pleasing to the eye. For a variety of biophysical and evolutionary reasons most humans find plants more attractive to look at than most non-living walls. Softening the impact is not the same as eliminating the train altogether. Bruce may have others links and photos to offer, but a good place to start is Patrick Blanc's website. He is a master of vertical garden design and a research scientist at CNRS in France. In our climate it is quite feasible to design living walls with far more visual appeal than ivy alone. bikerider, for the record, I live in Menlo Park, and I lived in Palo Alto prior to that. Last time I looked, there wasn't a residency requirement to be interested in a statewide project. For the scale of aerials being proposed, it is preposterous to suggest ivy, Acacias, or any other landscaping will "soften" the impact. I don't think this should necessarily preclude construction of aerials, but to suggest that landscaping will just cover up the visual impacts is intellectually dishonest.See what you did there? "Soften" and "cover up" are not the same thing, but you seem to think they are interchangeable. Landscaping absolutely can soften the impact, without hiding it completely. The current landscaping doesn't hide it completely either. We've made plenty of use of Google Street View in these discussions and we can find lots of eyesores on the Caltrain right-of-way in its current state. But the places that do have landscaping are an improvement over the parts that do not. @ PA_Marcher, here are 10 different designs on a wide range of scales from the Global Grind. "I wonder how many HSR "proponents" in this and other blogs post from far off locations"
I certainly do, having done my train riding in the decade I was living in Oz, and presently living in Ohio. When looking at part of a project of national significance, which will likely receive more federal than state capital works funding, and which will deliver strong net economic benefits to the area that it is passing through ... including substantial economic benefits to the Peninsula towns, as those area residents aware of which century they are living in ought to realize ... it would be quite unusual if it did not attract attention from beyond the Peninsula itself. "For the scale of aerials being proposed, it is preposterous to suggest ivy, Acacias, or any other landscaping will "soften" the impact." You really have to be specific about which stretch of corridor you are talking about before it is clear what the range of options are with respect to height in that area. For a full height elevation, the choice between a living wall and a Mediterranean arch colonade is about the aesthetics of the setting as much as anything else ... and, indeed, if there was a full height elevation separating El Camino Real from a suburban residential area, an arch colonade over a walkway and cyclway on the thoroughfare side and landscaped berm to a living wall on the residential side could easily be the preference ... when people talk about berms they forget that in the majority of the right of way where there is extra room to work with, a berm can be on one side and a viaduct or wall on the other. The pragmatic approach is to develop the range of options, provide an indicative cost of each option, and determine the threshold level for providing transport improvement that CHSRA might be expected to pay for, to get an idea what the local tab would be for each of the options. It may be that there is an option in the range of what can be justified for CHSRA to spend money on that is more appealing to the local community than the gold brick options that the HSR opponents are trying to push as a strategy to sink the project. bikerider: I will admit that I'm currently posting from a far off location on the East Coast, but I have spent the last three summers working in the Bay Area, with two summers living in Santa Clara and Sunnyvale, and one living in SF and working in Santa Clara, commuting daily by Caltrain and bike. I also spent four years living in LA, and before that I was on the East Coast. I've ridden the Northeast Regional more times than I can count, and have made multiple trips on the Pacific Surfliner, San Joaquin, and Capitol Corridor. So that's where my opinions are coming from. I have posted an article that addresses (some) of the tunneling issues of the Transbay Terminal. It's not exactly the same topic as is discussed here, but I'd really appreciate anyone coming by to read it. Thanks! In case anyone is interested in what 4 tracks above ground would actually look like. Here's a link to the Google Maps overhead view of the Caltrain tracks just north of Atherton in Redwood City (or technically unincorporated San Mateo County's North Fair Oaks) where there are already 4 tracks today." and if you look at that pic you can clearly see that the right of is wide enough to continue that 4 tracking to the south of where it leaves off without disrupting any property. So why are they making such a big deal about it. the ROW is four tracks wide already. I used to live in SF a block from the N-Judah tracks.How do think your old SF neighborhood would feel if an unaccountable state agency came in and said those tracks were going to be raised 20' off the ground on concrete embankment? I don't think arguments like "surely the ROW can make it fit" or "shrubbery will 'soften' the impact" would go over too well. The concept of "softening" a visual impact is one of creating visual distraction that is more pleasing to the eye.See also: "putting lipstick on a pig". Tracks that run at-grade are human-scale (even on 4-track ROW). Making elevated rail structures human-scale can be done, but is not easy and really has nothing to do with plant species used. Due to extreme costs of tunneling, and ill-advised alignment decision, Palo Alto and other cities are probably left with no other choice. This is, of course, unfortunate; and while this does not preclude building the project, it is just disingenuous for foamers to discount what is an obvious environmental impact. BTW, BART's aerials along the Ohlone trail are (supposedly) example of best practices of building aerials through residential neighborhood. But as far as I can tell, BART has never spent even one dime on the landscaping, lighting, upkeep, or anything else associated with Ohlone trail area. Not even when copper thieves started stealing wire for the lighting. All the extensive landscaping work (many millions of dollars worth) have been paid by local cities. How do think your old SF neighborhood would feel if an unaccountable state agency came in and said those tracks were going to be raised 20' off the ground on concrete embankment?The N-Judah is a light rail line on a street surface (Carl Street at that location and Judah for most of its route). Caltrain is a heavy rail passenger line that operates on an ancient (>100 year old) heavy rail right of way that still has daily freight traffic in addition to Caltrain. The myth that Caltrain is just another light rail service along the surface of a city street for a few miles in San Francisco is comical. It is a heavily trafficked, ancient railroad corridor with double decker trains pulled by diesel locomotives. It is one of the oldest heavy rail corridors on the West Coast and the origin of our Peninsula cities and towns, which now rather ironically complain about it. The process of grade separating crossings has been ongoing for the length of the route for decades: Oregon Expressway, San Antonio Road, Belmont, San Carlos, etc. It would seem only logical for anyone fond of cycling to support grade separation of rails and roads. As for "putting lipstick on a pig", it is more akin to putting shrubs in front of a pig. All the extensive landscaping work (many millions of dollars worth) have been paid by local cities. "Local cities" basically equals El Cerrito. Given that El Cerrito got access to a modern rapid transit system that attracts ridership equal to more than half the city's population each weekday, I'd say they got a pretty good deal. (Weekday exits at El Cerrito Plaza + El Cerrito Del Norte = 12,500; El Cerrito population = 23,000) I'm sure they much rather have BART and pay a few million bucks to landscape it than not have BART at all. How do think your old SF neighborhood would feel if an unaccountable state agency came in and said those tracks were going to be raised 20' off the ground on concrete embankment?If the N-Judah ran diesel-powered trains at 79mph, heavy freight trains at night, and blew loud horns at every grade crossing, the folks in Cole Valley and the Sunset would have been agitating for grade separation years ago. I lived in that neighborhood as well, trying to draw an analogy between city light rail and heavy rail won't work. Imagine if 100 years ago folks in San Carlos said "no automobiles on Old County Road! We like our stagecoaches just fine, it works for our community." A topic that has not received much attention is what I will call ROW transitions. These are sections of the ROW in which the tracks must change elevation in order to implement a grade separation strategy. Examples of transitions: 1) Tracks ascending from the surface onto a 20 foot high berm; 2) Tracks descending into a 30 foot deep tunnel; or 3) (Worst case?) descending from the top of a 20 foot berm into a tunnel which is 50 feet deep. Some questions are the following: 1) How long must such transitions be so that heavy freight trains can be accomodated, and HSR passengers will not experience a rough rollercoaster ride? 2) What will these transitions look like in terms of walls, fencing, catenary poles, and the like? 3) Can transitions be built without needing shoofly tracks and still not impact Caltrain service? Thanks for your posts. There aren't going to be any tunnels or even any trenched sections of track, for reasons which should just have been made obvious here, so that's just not of interest. To achieve a 1% grade given a vertical radius of 6400m requires a run of 64m. To gain 4m at 1% including transitions will be 464m. 1.25% gives 400m, 1.5% 362m). A 7m change = 764m @ 1.0%, 641m @ 1.25%, 563m @ 1.5%. So basically to go from running at grade to a nice human-friendly, pleasant-station-appropriate level of circa 4m above grade (2.5m vertical clearance at grade plus 1.5m of track and deck structure) requires a ramp of on the order of 400+m. As for construction, ramps would be built exactly the same way as the embankments and/or viaduct structures to which they connect: move Caltrain tracks sideways to one extreme of the ROW, build half the structure (assuming four track structure, which wouldn't be necessary were it not for the stinking festering outright corruption of Pachecho), connect tracks to the new structure, build the other half structure, done. Stations will be more complicated in the case of minor stations with a central island platform with two tracks to each side. Either a temporary outside platform could be built ($$$) or, assuming some basic operating and timetabling skill, stopping trains could be single-tracked to the single platform temporarily. In the end there aren't going to be all that many transitions and elevated sections required. * Above through San Bruno. * At grade at Millbrae. * Down under 92 then up again for Hillsdale. * Up through Redwood City and then dive (HERE is the only tunnelling!) under Highway 84 at Redwood Junction where the burrowing HS line heads off to the Dumbarton tunnel crossing and the Altamont Pass. A significant plus of grade separating (ie raising) Caltrain is the opportunity to begin "daylighting" the horribly-abused creeks of the Peninsula. You can see the very smallest beginnings of this with Brittan Creek in San Carlos; much, much, much more is possible. On the other hand, a trenched or tunnelled line is going to interfere with and even further degrade (yes, that's possible, hard and sad as that it is to imagine) every water course is crosses, of which there are many many more than are apparent when looking around at present grade level of urban sprawl hell. The last point is that the global oceans, and hence the Bay, and hence water tables, are going to be rising a great deal faster in the coming decades than anybody cares to even have nightmares about. Don't you think Caltrain should be the last thing to sink? "Tracks that run at-grade are human-scale (even on 4-track ROW). Making elevated rail structures human-scale can be done, but is not easy and really has nothing to do with plant species used." An viaduct on an arch colonnade is human scale, provided there is enough visual interest at grade so that the focus is on the colonnade rather than on the trains running overhead. There's nothing remotely hard about that, its just a matter of deciding whether its worth the extra cost over an ugly and utilitarian elevated rail line. A 4 foot tall wall and a 4 foot high, 12 to 15 foot back embankment is eminently human scale and, again, not hard. Making a full elevation to human scale is harder, but why in the hell do you need to have semi-truck clearances at every single one of the grade separations? Cut the height you have to pass over, and you reduce the height of the wall / embankment / colonnade. And even then, its not actually hard, just relatively harder. On a scale with an eight foot embankment as "easy" and a tunnel as "easy", making a 20 foot wall work on a human scale is on the easy side of the spectrum. Near a town center, obviously you want to take the line through in a viaduct at second floor height ... and build sidewalk space retail, restaurant, leisure and residential into the structure. Again, not "hard" by any stretch of the imagination. Near a town center, obviously you want to take the line through in a viaduct at second floor height ... and build sidewalk space retail, restaurant, leisure and residential into the structure. Again, not "hard" by any stretch of the imagination.I can't imagine that. The underside of a train viaduct isn't inherently a great deal more lovely than the underside of road bridges -- though it will be a lot narrower, less noisy overall, and much less of a dead zone because it is (at a station) an active attractor of pedestrian traffic. Not only that, but your (and my) aim of minimizing track height is rather incompatible with creating an attractive general purpose retail space. A snack/coffee vendor for train riders on the go maybe, but let's not get carried away here. In a less suburban environment things could be very different indeed, but just as San Jose isn't Paris, San Bruno station isn't about to turn into a retail hub. Sorry. "I can't imagine that. The underside of a train viaduct isn't inherently a great deal more lovely than the underside of road bridges." Neither is it inherently less lovely than the underside of the second floor of a building, but there are lots of examples of open air arcades, closed malls, and, even, first floors of buildings underneath the not-inherently-lovely underside of the second floor of a building. Obviously, when what is beneath a bridge is supposed to be a road and motorists are supposed to keep their eyes on the road, there is less point in investing in the underside than when what is beneath a viaduct is a bricked arcade. "Not only that, but your (and my) aim of minimizing track height is rather incompatible with creating an attractive general purpose retail space." Normally the focus of retail structures built into a viaduct is on the sidewalk on the edge of the viaduct. An open air arcade would spill out from the arcade into the sidewalk for a combination of shade side and sunny side outdoor seating. A key target for TOD would indeed be in the two to four block stretch along the corridor at local Caltrain platforms in walking distance to a recognizable town center ... and, indeed, taking advantage of the elevation to bring platform entrances up from more than one block. In that kind of streetscape, optimizing the height is not the same as minimizing the height, since there is a benefit from being high enough to permit ground floor structure to be built in underneath the viaduct support. But if the ideal "downtown" height and the ideal "suburban" height are different in height by two meters ... is that a rail corridor design challenge? With a 500m transition zone, that's a 1:250 grade. If I understand correctly, the ruling grade for HSR is not the 1:40 of some electric mass transit systems, but I wasn't thinking that a couple of meters in the core TOD zone is a serious problem. Ramps over and under streets-- how well can freights handle them? in general, heavy freight operators prefer gradients of no more than 1-1.25% but the Tehachapi loop has 2.2%. Because the loop is both tight and steep, trains slow down to bicycle speed there. That overpass in San Bernardino does look pretty steep, but I guess if you have two locomotives and the train isn't too long or the cars are not laden 3% is doable. In Switzerland, electric locomotives pull much shorter medium freight trains up hills with 5.5% gradients at a fair clip. While I agree with Richard Mlynarik that HSR via Altamont would have been preferable overall, the current plan calls for Pacheco, which means going through Silicon Valley. It could make both the design and the construction of the alignment there easier and cheaper if the old Dumbarton rail bridge were repaired first so at least UPRR doesn't need to run trains through the mid-peninsula any longer. Getting Caltrain to detour via Newark and Alviso would be harder, but there might be days/weeks when they would accept substitute bus service south of RC to facilitate the construction of particularly tricky sections. In an environmental review process, the presumption is that the positive benefits of the project exceed the negative neighborhood impacts. The net positive impact does not absolve agencies from having to identify and mitigate neighborhood impacts. Good luck convincing the court that elevated rail structures do not have negative impacts. BTW, 'local cities' == El Cerrito, Albany, Pleasanton just to name a few. Others (such as Fremont and Oakland) have just let the landscaping die off. 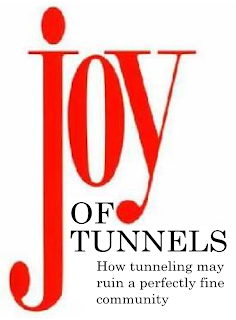 Tunnels are a 'joy'. Yet despite the problems associated with tunnels there are places where an extra investment is worthwhile. SFO is a prime example. @Brian: the real missed opportunity was a failure to connect the AirTrain with Caltrain at San Bruno. But that's bygone history... the next best option was discussed in Focus on: Millbrae and Lemonade from Lemons (see comments), and involves bringing the AirTrain out to the Millbrae station. This provides value not only for HSR customers, but also all peninsula residents south of Millbrae who could then ride transit to SFO. 20 feet just to clear the trains, huh? So the mighty port of SF can finally start running their fleets of double-stack container trains? Minus three feet if they relent on the AAR Plate H silliness. Yeah, not a big difference in the grand scheme, but the plate H thing is just so goofy. Rather ventilate the tunnel for a diesel locomotive. One could either use a electric, with a generator for siding work. Or even simpler just use an electric locomotive and tow a diesel for siding work... This has got to be insanely cheaper. The trains are short and on a dead end. (They always return to the same yard.) I'm sure they could figure it out. @Randy, forced ventilation is not just required for diesel trains. It is a fire protection requirement. You'll see it in any train tunnel used exclusively by electric trains, such as for example BART. If HSR is going to run in a tunnel, why limit its speed? I am sure that there are some air pressure issues running at 350 kph (220 mph) in a tunnel, but I assume someone in the world has worked on that issue.